Josif (Josef) Vissarionovich Stalin (Russian: Иосиф Виссарионович Сталин, Vissariónovich Iosif Stalin), real name Ioseb Jughashvili (Language Georgia: იოსებ ჯუღაშვილი, Russian: Иосиф Джугашвили, Iosif Dzhugashvili ;) (born December 18, 1878 - died March 5, 1953 at the age of 74 years) is the leader of the Soviet Union and a very tyrannical dictator, also known as the "Man of Steel" as a name (Stalin or Steel Man). He is thought to have ordered the murder of about 30 million inhabitants of Russia and surrounding countries. He is also known as a person who hates religion. Initially he entered the seminary in Tbilisi, but he then became not believe in God after reading the book Origin of Species by Charles Darwin. He appeared as the General Secretary of the Communist Party of the Soviet Union. Stalin's main rival was Leon Trotsky. When at last the whole party was in the grip of Stalin, Trotsky were driven out of the Soviet Union and then murdered in Mexico around 1940. And when Lenin died on January 21, 1924, Stalin appeared as the new leader of the Soviet Union. He treated his rivals or anyone who disagrees with him is cruel and inhumane, especially during major cleanup in the Soviet Union which took many lives. They were all sentenced to death as an enemy of the Soviet state or put into forced labor camps or prison. Gulag prison camp is one of the silent witness to the cruelty of Stalin during the Great Terror in the Soviet Union. When World War II (1939-1945) broke out, the Soviet Union's war with Britain and the United States against Nazi Germany. But after the war, Stalin put "Iron Curtain" between Western allies and the Soviet Union and most Eastern European countries become communist state. 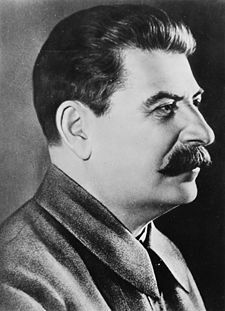 Stalin ruled until his death at the age of 74 years. His death was allegedly due to poisoning by Lavrenty Beria gang leader. During his reign he not only oversees the entire former Soviet states, but also countries outside the Soviet Union.